This post is about a citation analysis that didn’t quite work out. I liked this blackboard project by Manuel Théry looking at the influence of each paper authored by David Pellman’s lab on the future directions of the Pellman lab. I'm working on a new project for @criparis students: "The Tree of a Lab"
It reminds me that papers can have impact in the field while others might be influential to the group itself. I wondered which of the papers on which I’m an author have been most influential to my other papers and whether this correlates with a measure of their impact on the field. There’s no code in this post. I retrieved the relevant records from Scopus and used the difference in “with” and “without” self-citation to pull together the numbers. Influence: I used the number of citations to a paper from any of our papers as the number for self-citation. This was divided by the total number of future papers. This means if I have 50 papers, and the 23rd paper that was published has collected 27 self-citations, this has a score of 1 (the 23rd paper nor any of the preceding 22 papers, can cite the 23rd paper, but the 27 that follow, could). This is our metric for influence. Impact: As a measure of general impact I took the total number of citations for each paper and divided this by the number of years since publication to get average cites per year for each paper. Reviews and methods papers are shown in blue, while research papers are in red. I was surprised that some papers have been cited by as much as half of the papers that followed. Generally, the articles that were most influential to us were also the papers with the biggest impact. Although the correlation is not very strong. There is an obvious outlier paper that gets 30 cites per year (over a 12 year period, I should say) but this paper has not influenced our work as much as other papers have. This is partly because the paper is a citation magnet and partly because we’ve stopped working on this topic in the last few years. Obviously, the most recent papers were the least informative. There are no future papers to test if they were influential and there are few citations so far to understand their impact. It’s difficult to say what the correlation between impact and influence on our own work really means, if anything. Does it mean that we have tended to pursue projects because of their impact (I would hope not)? Perhaps these papers are generally useful to the field and to us. In summary, I don’t think this analysis was successful. I had wanted to construct some citation networks – similar to the Pellman tree idea above – to look at influence in more detail, but I lost confidence in the method. Many of our self-citations are for methodological reasons and so I’m not sure if we’re measuring influence or utility here. Either way, the dataset is not big enough (yet) to do more meaningful number crunching. Having said this, the approach I’ve described here will work for any scholar and could be done at scale. There are several song titles in the database called ‘For What It’s Worth’. This one is Chapterhouse on Rownderbout. We have a new paper out. It’s not exactly news, because the paper has been up on bioRxiv since December 2016 and hasn’t changed too much. All of the work was done by Nick Clarke when he was a PhD student in the lab. This post is to explain our new paper to a general audience. We have invented a new way to tag proteins in living cells so that you can see them by light microscopy and by electron microscopy. Proteins do almost all of the jobs in cells that scientists want to study. We can learn a lot about how proteins work by simply watching them down the microscope. We want to know their precise location. Light microscopy means that the cells are alive and we can watch the proteins move around. 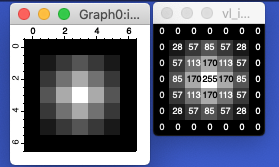 It’s a great method but it has low resolution, so seeing a protein’s precise location is not possible. We can overcome this limitation by using electron microscopy. This gives us higher resolution, but the proteins are stuck in one location. When we correlate images from one microscope to the other, we can watch proteins move and then look at them with high resolution. All we need is a way to see the proteins so that they can be seen in both types of microscope. We do this with tagging. Tagging proteins so that we can see them by light microscopy is easy. A widely used method is to use a fluorescent protein such as GFP. We can’t see GFP in the electron microscope (EM) so we need another method. Again, there are several tags available but they all have drawbacks. They are not precise enough, or they don’t work on single proteins. So we came up with a new one and fused it with a fluorescent protein. What is your EM tag? We call it FerriTag. It is based on Ferritin which is a large protein shell that cells use to store iron. Because iron scatters electrons, this protein shell can be seen by EM as a particle. There was a problem though. If Ferritin is fused to a protein, we end up with a mush. So, we changed Ferritin so that it could be attached to the protein of interest by using a drug. This meant that we could put the FerriTag onto the protein we want to image in a few seconds. In the picture on the right you can see how this works to FerriTag clathrin, a component of vesicles in cells. We can watch the tagging process happening in cells before looking by EM. The movie on the right shows green spots (clathrin-coated pits in a living cell) turning orange/yellow when we do FerriTagging. The cool thing about FerriTag is that it is genetically encoded. That means that we get the cell to make the tag itself and we don’t have to put it in from outside which would damage the cell. What can you use FerriTag for? Well, it can be used to tag many proteins in cells. We wanted to precisely localise a protein called HIP1R which links clathrin-coated pits to the cytoskeleton. We FerriTagged HIP1R and carried out what we call “contextual nanoscale mapping”. This is just a fancy way of saying that we could find the FerriTagged HIP1R and map where it is relative to the clathrin-coated pit. This allowed us to see that HIP1R is found at the pit and surrounding membrane. We could even see small changes in the shape of HIP1R in the different locations. We’re using FerriTag for lots of projects. Our motivation to make FerriTag was so that we could look at proteins that are important for cell division and this is what we are doing now. Is the work freely available? Yes! The paper is available here under CC-BY licence. All of the code we wrote to analyse the data and run computer simulations is available here. All of the plasmids needed to do FerriTagging are available from Addgene (a non-profit company, there is a small fee) so that anyone can use them in the lab to FerriTag their favourite protein. How long did it take to do this project? Nick worked for four years on this project. Our first attempt at using ribosomes to tag proteins failed, but Nick then managed to get Ferritin working as a tag. This paper has broken our lab record for longest publication delay from first submission to final publication. The diagram below tells the whole saga. The publication process was frustratingly slow. It took a few months to write the paper and then we submitted to the first journal after Christmas 2016. We got a rapid desk rejection and sent the paper to another journal and it went out for review. We had two positive referees and one negative one, but we felt we could address the comments and checked with the journal who said that they would consider a revised paper as an appeal. We did some work and resubmitted the paper. Almost six months after first submission the paper was rejected, but with the offer of a rapid (ha!) publication at Nature Communications using the peer review file from the other journal. Hindsight is a wonderful thing but I now regret agreeing to transfer the paper to Nature Communications. It was far from rapid. They drafted in a new reviewer who came with a list of new questions, as well as being slow to respond. Sure, a huge chunk of the delay was caused by us doing revision experiments (the revisions took longer than they should because Nick defended his PhD, was working on other projects and also became a parent). However, the journal was really slow. The Editor assigned to our paper left the journal which didn’t help and the reviewer they drafted in was slow to respond each time (6 and 7 weeks, respectively). Particularly at the end, after the paper was ‘accepted in principle’ it took them three weeks to actually accept the paper (seemingly a week to figure out what a bib file is and another to ask us something about chi-squared tests). Then a further three weeks to send us the proofs, and then another three weeks until publication. You can see from the graphic that we sent back the paper in the third week of February and only incurred a 9-day delay ourselves, yet the paper was not published until July. Did the paper improve as a result of this process? Yes and no. We actually added some things in the first revision cycle (for Journal #2) that got removed in subsequent peer review cycles! And the message in the final paper is exactly the same as the version on bioRxiv, posted 18 months previously. So in that sense, no it didn’t. It wasn’t all a total waste of time though, the extra reviewer convinced us to add some new analysis which made the paper more convincing in the end. Was this worth an 18-month delay? You can download our paper and the preprint and judge for yourself. Were we unlucky with this slow experience? Maybe, but I know other authors who’ve had similar (and worse) experiences at this journal. 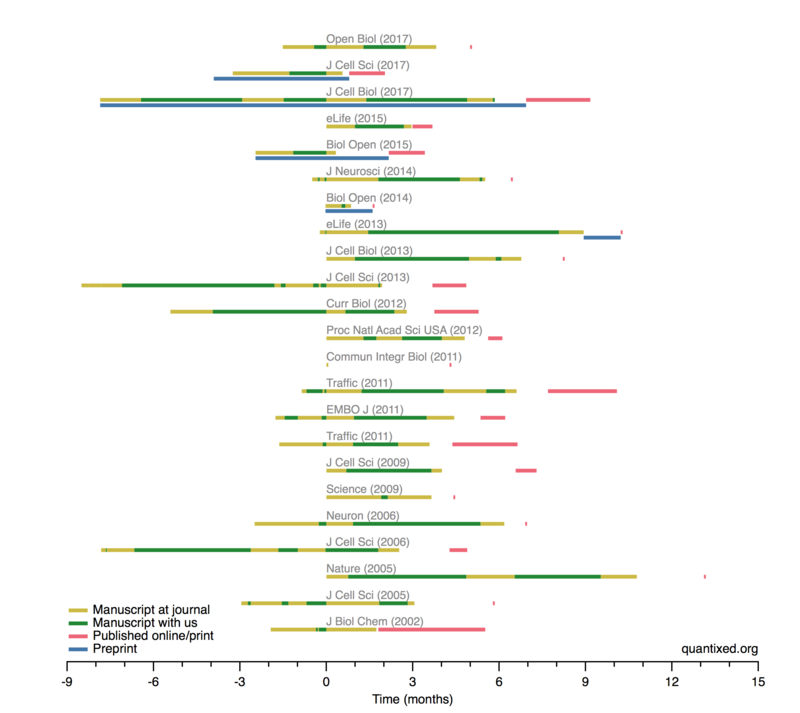 As described in a previous post, the publication lag times are getting longer at Nature Communications. This suggests that our lengthy wait is not unique. It has the Nature branding (which, like it or not, impresses many people). The papers look great (in print and online). But there are downsides too. The APC for each paper is £3300 ($5200). Obviously open access must cost something, but there a cheaper OA journals available (albeit without the Nature branding). Ironically, paying a premium for this reputation is complicated since the journal covers a wide range of science and its kudos varies depending on subfield. It’s also slow, and especially so when you consider that papers have often transferred here from somewhere else. It’s essentially a mega journal, so your paper doesn’t get the same exposure as it would in a community-focused journal. Overall it was a negative publication experience with this paper. Transferring a paper along with the peer review file to another journal has worked out well for us recently and has been rapid, but not this time. Please leave a comment particularly if you’ve had a positive experience and redress the balance. The post title comes from “Ferrous” by Circle from their album Meronia. There have been several posts on this site about publication lag times. You can read them here. Lag times are the delays in the dissemination of scientific data introduced by the process of publishing the paper in a journal. Nowadays, your paper can be online in a few hours using a preprint server. However, this work is not peer reviewed. Journals organise a formal peer review and provide some sort of certification of the work. They typeset the work and all of this adds delays the dissemination of work in a journal. To look at publication delays, you can use PubMed data, which is incomplete but can give insight into how long these delays can be. Previous posts have involved the use of a ruby script to make a csv file from PubMed XML output and then use this in Igor to calculate the publication lag times. There is another method detailed in this excellent post by Daniel Himmelstein. I recently posted a figure for Nature Communications lag times on Twitter and was asked to generate others. I figured that I should write an R script and people can make their own! The PubMedLagR code is available here with instructions for use. Retrieves all paper for this journal. The range from 2010 to 2018 is for illustration, this journal has only been in operation for these years. Filtering for journal articles rather and attempting to get rid of reviews and front matter is wise, but doesn’t always work. Again this journal doesn’t carry this material so this is for illustration. Getting your query right is very important. Save the results in XML format and then run the R script as directed. This should give a csv of the data and a png of the lag times. This is data from Nature Communications. Colleagues had two separate papers accepted at this journal and experienced long delays. I was interested to see if papers were generally taking longer to publish here. Of course we do not know why. Delays are partly the fault of the authors, the reviewers and the journal and it is not possible to say why publication lag times are increasing for this journal year-on-year. The journal has grown in terms of number of papers published, has this introduced inefficiencies? Are reviewers being slow to review? Are they being more demanding? Are Editors not marshalling the referee reports and providing clear guidance to authors? Allowing too much time and too many rounds of revision? Are authors being too slow to do further experimental work? The answer will be yes to some of these questions for some of the papers. This is not to focus on Nature Communications, it’s one of a few journals that many colleagues complain is too slow to publish their work. With this code you can have a look at the journal you are interested in submitting to and consider whether there is a more rapid venue for your work. I changed the code slightly and prettified the plots just a little. Below are some plots for Nature Cell Biology, Nature Neuroscience. I also did a search for clathrin or CRISPR papers over the same time period. These keyword searches are fairly flat, whereas the journal-specific increase in publication lag time can be seen. The lag times at Nature Neuroscience look artificially low and then seem to have jumped up in 2016 to be something similar to Nature Cell Biology or Nature Communications. I neglected to point out that the code truncates the y-axis in the bottom right plot to 1000 days or the maximum lag time, whichever is smaller. This is because it gets difficult to see the data points if there is an outlier, which might be due to an error in PubMed data. A reader commented on Twitter that some poor paper had a lag time almost 1000 days. Well, due to the y-axis truncation we don’t see that 9 papers in Nature Communications since 2010 have lag times (RecAcc) of > 1000 days. The record holder has a lag time of 1561 days! I checked that this was not a PubMed error by looking at the dates on the paper. Date information is not available in PubMed for every paper unfortunately. This is especially true of older papers. The date information is supplied to PubMed from the journal. These dates are not necessarily accurate: 1) you can see occasional errors in the data, 2) journals sometimes “reset the clock” on papers and treat resubmissions as new submissions. The post title is taken from “10 Years vs The Spread” by Wing-Tipped Sloat from the LP Chewyfoot. Obviously the song has nothing to do with smoothed kernel density estimates of journal publication lag times, but the title was incredibly apt.